Your agricultural support station is in the heart of Sherman County. Visit the OSU (Agricultural) Extension Office today! Sherman County's Extension Service delivers objective, research-based, non-formal education to help North Central Oregonians solve problems, develop leadership, and manage resources wisely. The Extension is here for anyone looking for research-based, practical information concerning nutrition, food safety, ag money management, livestock, and agriculture. To that end, Oregon State University's Extension Service staff oversee Sherman County 4-H programs and collaborate with the Sherman County Fair Board to produce the annual Sherman County Fair and Rodeo. 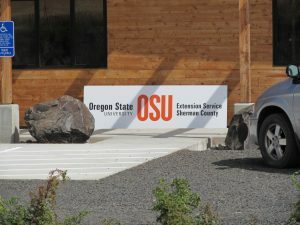 The Extension Service offices are located at the Sherman Station agricultural research lab in Moro, which is managed by OSU Extension’s Columbia Basin Agricultural Research Center in Adams. Field research in Moro "emphasizes the production of wheat and rotational crops such as barley, legumes, and canola." The Sherman County Extension Office is here to serve the gardening, farming, and agricultural needs of all who have come to settle in this "Land Between the Rivers" and "Land of Wheat." Over time, Sherman County has become the third largest wheat-producing county with — thanks to it also being the only naturally unforested county — the largest till-area percentage in all of Oregon. Explore Sherman County's agricultural extension services that fit your needs at http://extension.oregonstate.edu/sherman/. To review records kept by the Sherman County Extension Service, contact cindy.brown@oregonstate.edu or sue.mabe@oregonstate.edu.